Lisboa: Círculo de Leitores, 1991. This is the Portuguese hardback edition of Talking God, the ninth book in Tony Hillerman's Navajo Mystery Series. This 1991 edition was published by Círculo de Leitores in Brazil. The text was translated from English into Portuguese by Maria Nóvoa. 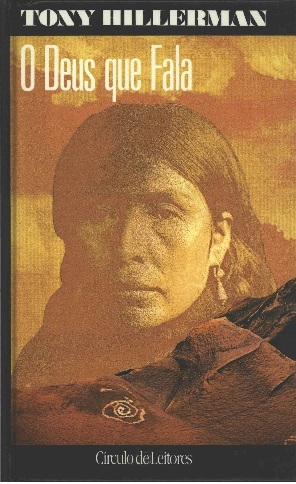 The cover, designed by Rochinha Diagos features a photographic image of the face of a Navajo woman, a sandstone formation with a spiral petroglyph and layered clouds. Format: Hardback, 20.1 x 12.5 cm. Binding: Full color boards with a photographic image of the face of a Navajo woman, a sandstone formation with a spiral petroglyph and layered clouds. The author's name and title are printed vertically, in white against a black background, on the spine.